4K Video Processing: How to Play 4K Video on Mac without Choppy and Stutter? I bet this is not a problem of you and me, but the one for widespread Apple users. As you're trying to play 4K HEVC on Mac with VLC, MplayerX or IINA, the 4K video may be choppy, lagged, stuttered or totally fail to play. 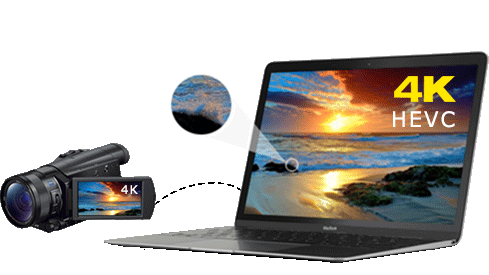 Then what you desired most is to solve this problem and make your 4K video play smoothly on Macbook Pro/Air, Mac Pro etc. If so, it's essential to get the root of the matter. Here comes why you fail to play 4K videos on Mac and an easy solution to fix it. MacX Video Converter Pro to transcode 4K videos to HEVC or H.264, MP4, MOV and adjust parameters like comressing resolution, change bitrate, frame rate etc. to make it best fit your Mac hardware configuration. Why Can't You Play 4K Video Smoothly on Mac? We all know that hardware configuration matters a lot for 4K video playback on Mac. Firstly, except the new 4K Retina 21.5-inch iMac and the 5K Retina 27 inch iMac, no Mac can play 4K 2160p videos without the help of 4K external displays using either the built-in HDMI port and/or using Mini DisplayPort adapters via Thunderbolt. But it doesn't mean that you definitely can watch Ultra High-definition videos with the 4K external displays. Other hardware and video itself are also critical. Now get in back to the point. Check the possible reasons of 4K video playback failure. 1. CPU doesn't accelerate HEVC codec. An increasing number of people encode 4K videos with HEVC codec for saving up to 50% storage space compared to H.264. But you know what? HEVC is a hard codec to decode and only the new CPUs are acclerated for it. Even if you've updated to the HEVC compatible High Sierra, the 4K video won't be played smoothly. 2. High CPU usage on Mac. If the CPU usage is too high, you will fail to play 4K video as well. For example, for the initial question, according to the publisher, when playing 1080p uses about 130% CPU usage, where these 4k h265 files use about 700% on a QuadCore. The GPU is not doing the work, the CPU is. 3. The 4K video itself. I find that 1 pass VBR 12Mbps good preset (medium setting) in Adobe ME is very good in general. Anything above that is just a waste of storage and space on your Macbook Pro/Air, Mac Pro. As you play the 4K video on IINA with this setting, the 4K video player only needs about 300% CPU to decode, other than the above mentioned 700%. And MPlayerX does much better job for this particular video, which plays 4K at 22-25FPS, but still not 30, not to mention the 60FPS 4K video recorded by iPhone X, iPhone 8/8 Plus. How to Play 4K Ultra HD Video on Mac Smoothly? It is indisputable that you need a 4K video player to enjoy 4K video on Mac placidly, but clearly not enough. As you can see, the hardware configuration limits a lot for 4K video playback on Macbook Pro/Air, Mac Pro. And compared to the insurmountable limitation of hardware, 4K video processing on codec, bitrate, frame rate etc. seems much easier to make it playable. MacX Video Converter Pro is exactly a tool to make these done. It enables you to transcode 4K video to H.264, HEVC, VP9, convert 4K UHD to MP4, MOV, MKV, M2TS and 200+ formats, adjust parameters like downscaling 4K resolution, cutting down the frame rate from 60fps to 30fps, 24fps, lowering the bitrate to 18Mbps or 12Mbps as you needed. Better yet, you don't have to wait up to 15+ hours to transcode a 2 hour movie to H.264 using Handbrake. Conversely, the whole process can be achieved in blazing fast speed, up to 5 times faster than Handbrake, thanks to the unique Intel QSV/Nvidia/AMD hardware acceleration technology. Step 1: Free download MacX Video Converter Pro and launch it on your Mac laptop. Click on + Video to load the 4K video you're willing to process. Step 2: Choose output profiles. You're suggested to select Mac General Video > MP4 Video (HEVC) or MP4 Video (H264) as you need. Step 3: Click to adjust the parameters. In the popup window, you're able to downsize bitrate to 18Mbps, 12Mbps, reduce the 60fps/30fps frame rate to 24fps, compress 4K resolution to 1080p/720p and even lower. Step 4: Tap RUN button to start 4K video processing. On condition that your Mac laptop configuration high enough for hardware decoding, the processing will be finished in a few minutes. • AMD A10-7800 APU . • You need to have a monitor which is capable of playing back 4K video if you want to properly play 4K. • Even if your computer meets the requirements, you may find that 4K video plays back choppy. This is due to the immense processing power required to play 4K and you're suggested to process 4K video properly with the method above. Safari Won't Play 4K at 60 FPS Problem Solved! What's Codec of Your 4K Ultra HD Video?